Faust the goal is to include any global team. We feel that is what's best. You can have a different opinion on what's best but we felt that brining the best quality of players overall is what's best. More viewers, more skill, More win.. no major team league has ever banned players based on location. Plain old wrong. Also you don't have a team in this league since x17 went 1-6 in patl then disbanded due to infighting kept playing because why not - helps us figure out who's actually an active BW player.. Fixed again. X17 is still in. By the way, throwing accusations out about people is really a bad habit for you to get in. One of SK's hallmarks is to repeatedly make claims without any backup or proof, and when asked for proof, not providing it. Are you throwing yourself into that lot as well? You best make sure of what you speak. Fair enough. I'm just kidding, I am not entering the league so I don't take a major or personal issue outside of personal opinions on this matter. However, from the outside looking in, the way this Korean situation has been handled seems a bit deceiving. 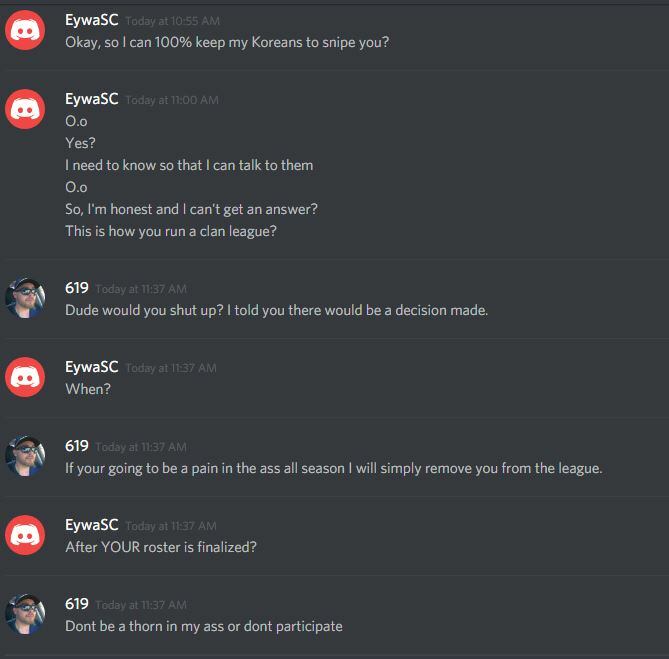 Players were under the impression no koreans were allowed, and now with less than a week until the league starts, it seems that decision has been reversed and people do not have a lot of time to add Koreans to their roster. I'll agree with you though, I enjoy watching strong line-ups play against each other, and think that seeing the top talent play against each other will produce more exciting games. As a viewer, I would be super excited to watch Scan play other strong Koreans. I just feel like maybe [SK] can be a little more open with their thought process and decisions so people don't feel misguided or confused. Edit: I meant less than a week to submit rosters, not until the league starts. It's so sad to see the community so divided when we all just want the best for Stacraft in the end. I really hope we can see something positive come from this. I hope Eywa and 619 can become friends and make something great for the community to enjoy. You guys clearly love the game and want whats best in the end I'm sure. Is this the official decision on the Korean matter then? I was told this morning that it was very much still in debate. Less than 1 week to go and I don't know who I'm going to be playing against nor who I can include on my roster??? what no i don't speak for SK just saying what the general tone is lol and trying to diffuse the nonsense. I see, you probably shouldn't try to explain a situation that is yet undecided then, since you're in the clan, people might take it the wrong way and think that is the official stance of the clan and the league. Why are you still a thing? Upon request, thread has been locked for now.